VirtueMart Application Programming Interface. Allow others to display and promote your VirtueMart products on their websites. Allow other shops to display and promote your Virtuemart products on their websites. 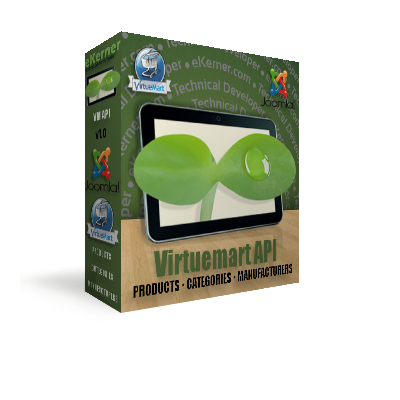 Supports Virtuemart Products, Categories, and Manufacturers. Works for any GET request like cURL, AJAX, file_get_contents(), etc. Responses in HTML or JSON. Products by category, popularity, featured, latest, random, recent. HTML layouts adjustable by products per row. JSON returns links to details pages and related media. 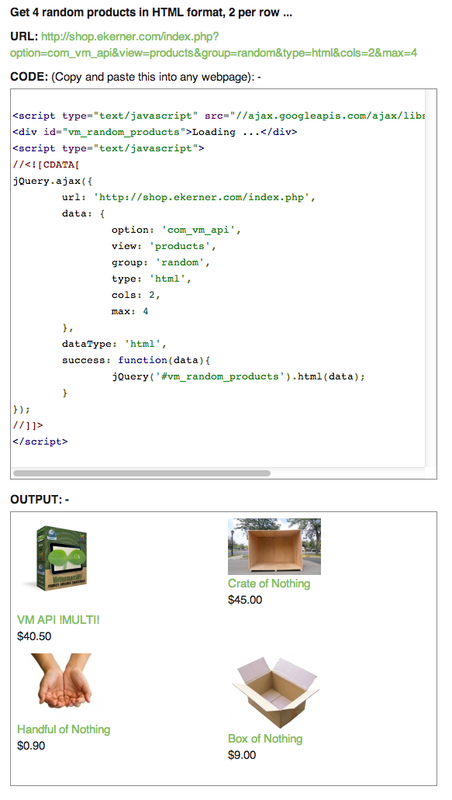 Displays Virtuemart Products, Categories, and Manufacturers via remote requests like cURL, AJAX, etc. Using this component and the methods documented in the component anyone can easily display and promote the products listed in this online store on any website that they have administrative access to. Simply copy and paste the code samples provided while installing the component into your websites HTML pages, its that easy!